Our first gig for 2012 was a welcome return early in May to the Women’s Night of Spirituality at St Mary Magdalene’s Church in Rose Bay. Dare we say there was no room at the inn? Three strong speakers shared their personal tales of growth and development with a packed house, revealing the highs and lows that have led them to their unique grasp of spirituality. Margaret Beazley, a judge of the Federal Court and the first woman appointed to the NSW Court of Appeal; Jessica Rowe, TV journalist and author, patron of the Mental Health Council of Australia, ambassador for Beyondblue and patron of its work on postnatal depression; and Gabrielle Lord, internationally selling author of adult and young adult fiction, who claims “a strong (and hard won) sense of the loving power of the creative force which inspires her day to day living”. The Bees were delighted to contribute some storytelling of our own in the form of Welcome Table, I Want to be Ready and Love and Joy. Having sung at the final service in the “pre-redevelopment” Wayside Chapel, we were honoured to be invited to contribute song to the Grand Opening of their $8.2M redeveloped facility in mid-May, continuing our rewarding association with this remarkable institution. The street was closed off for the celebrations and the crowd gave us a rousing response to Love and Joy, interspersing speeches from the likes of Ministers Tanya Plibersek and Gillian Skinner and MP Malcolm Turnbull. Oh Happy Day couldn’t have been a more fitting end to the formalities, as the ribbons were cut and the (eco-friendly!) heart-shaped balloons drifted skywards, signalling a re-invigorated Wayside Chapel, which has been a lifeline since the 1960s to Sydneysiders who have hit upon hard times. 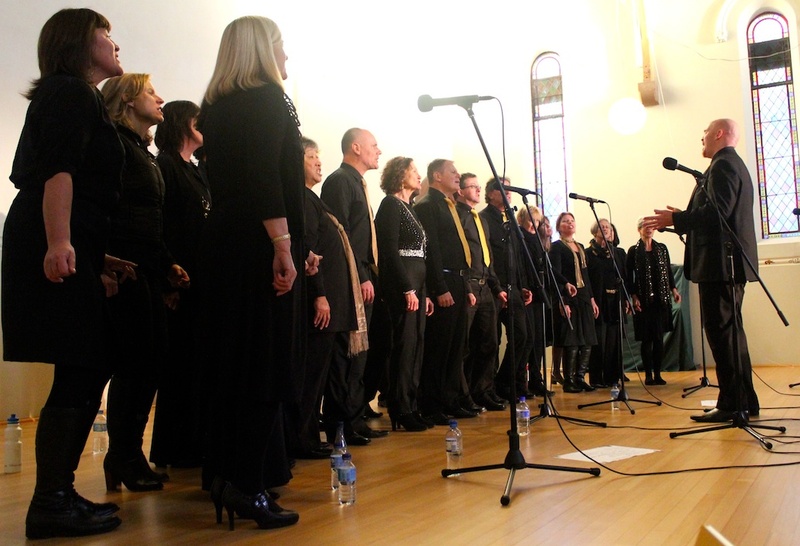 Our Winter SOULstice Concert took place in late June at The Annandale Creative Arts Centre. 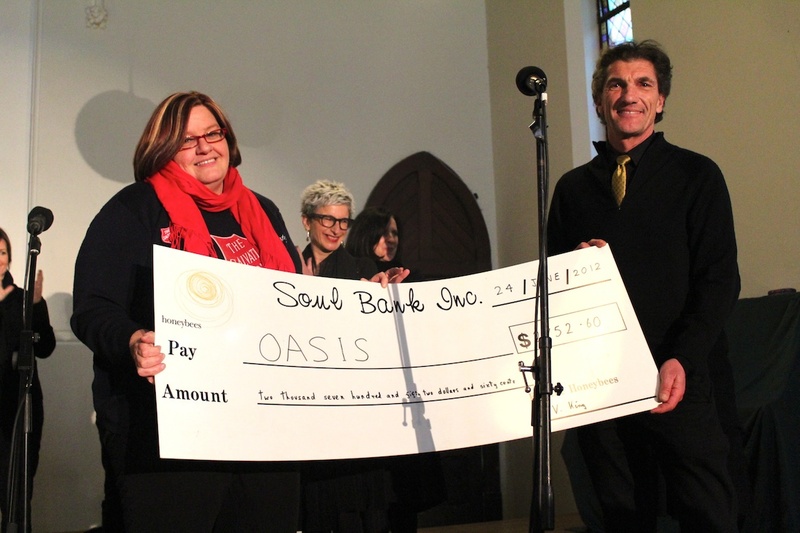 This year’s concert was to raise funds for The Oasis Youth Support Network and we were proud to raise over $3,000 – with the ‘Big Cheque’ presented by our treasurer Jerry at the end of the day. 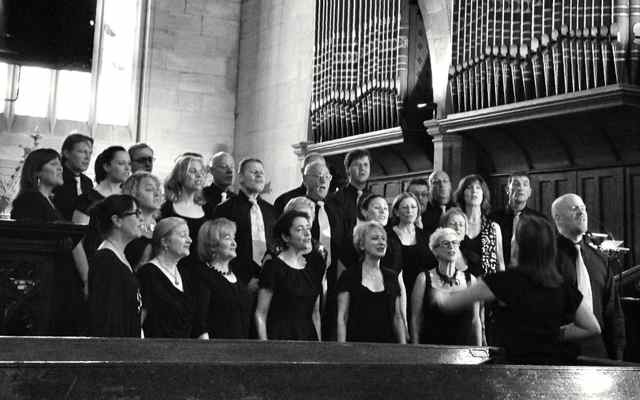 Over 150 audience members enjoyed a repertoire which included two new songs - Trouble of This World & Love & Joy with Jennie & JJ soloing respectively. Naturally the audience loved them, as they did some of our old favourites such as People Get Ready, Oh! Happy Day, I’ll Fly Away, People Get Ready, Shed a Little Light, Bubbles & Precious Lord as well as some fairly new numbers – namely Peace in the Valley & Every Day will be Sunday. Everybody in the room joined in with the audience participation song All Night, All Day. The afternoon’s set was bought to a close with a spine tingling rendition of The Storm is Passing Over. Overall all one of our most polished performance that not only got a few toes tapping and hands clapping but also warmed the soul on a cold winter’s day. Early July saw The Bees hold our second Gospel Groove Workshop - this time at the Wayside Chapel Hall, Potts Point. These full-day workshops are a joint initiative with the Sydney Community College. The 24 participants not only learned a number of 4-part SATB gospel pieces and heard the 'Bees Lite' perform, they also learned the background history of gospel music and its links with the Emancipation of Slavery and the Civil Rights Movement. The workshop was co-ordinated by Kevin, led by Musical Director, Steve and the excellent historical context was provided by Ladd. Songs learned included My Little Cup, Welcome Table, Lets Go, Turn Me Around & Shosoloza. the day was rounded off by an impromptu performance of a couple of songs for the Wayside Chapel. Click here for a short video of the workshop. Participants in our Gospel Groove Workshop - with a smattering of Bees! Late October saw us do a paid gig at The Mind and Its Potential conference at Darling Harbour. After a few days of warm up acts, the 500+ crowd certainly took to The Bees and gave us rapturous applause for our short set of Bubble, Shed a Little Light, How I Got Over & Oh! Happy Day. For the first time we lost our tenor Will off the back of the stage! He managed to climb back without missing a note, thus demonstrating strong "Will"-power! We were once again delighted to perform at the Danceability Concert in November. Danceability aims to enrich the lives of children and adults with intellectual or physical disabilities through dance and music in a safe, fun & caring environment. The Bees performed All Night, All Day and Love & Joy, during which the real stars of the show were able to change into their next set of costumes. In late November, The Bees performed as part of the Kings Cross Festival at St John's Anglican Church, Darlinghurst. We sang a number of songs on the theme of 'freedom' because Sunday November 25th was designated Abolitionist Sunday - a global initiative event sponsored by World Vision that focuses on issues of slavery and human trafficking. Our end of year Summer Concert at Sydney Boys High was another sell out success. Our numbers were augmented for three songs by the 'graduates' of the Gospel Groove Workshop for I Got Freedom on my Mind, Welcome Table & the South African/Zimbabwean unofficial national anthem - Shosholoza. We also had new songs/versions of old songs with Jennie singing Trouble of this World & Bern & Mike doing a duet in Ride on King Jesus. Another highlight of the concert was our world premiere version of Bob Dylan's Gotta Serve Somebody. 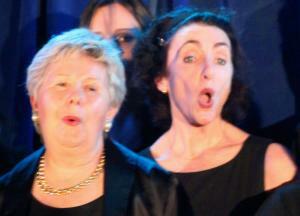 Especially arranged by our MD Steve Clarke, as far as we know this is the first time it has been perfromed a cappella. Proceeds from the concert went to the Sir David Martin Foundation and we were delighted to raise $5,000 to help them continue their great work among disadvantaged young people in Sydney.